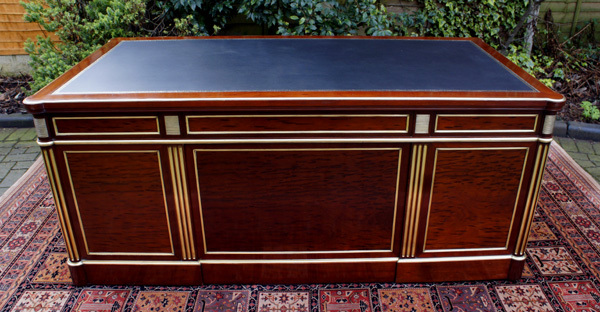 This stunning antique French Directoire desk from the latter part of the 19th century is made from well figured 'plum pudding' mahogany (Acajou moucheté) and trimmed with moulded brass borders. The desk is panelled on all sides, its architectural style with columns is very rare and it demands to be used as a free-standing piece of furniture and focal point of a room. 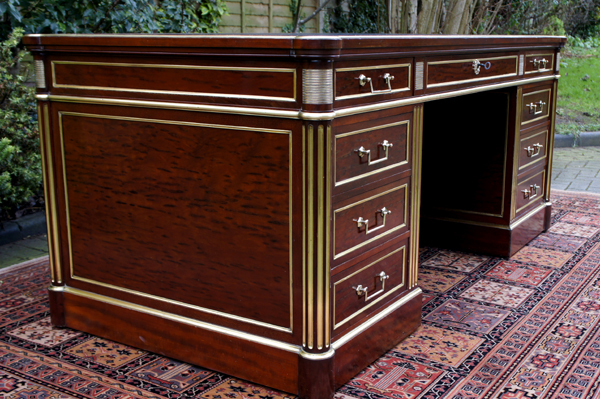 It is a very striking desk of top quality and its brass trim and brass handles make it a very decorative desk indeed. is made from well figured 'plum pudding' mahogany (Acajou moucheté) and trimmed with moulded brass borders. as a free-standing piece of furniture and focal point of a room. 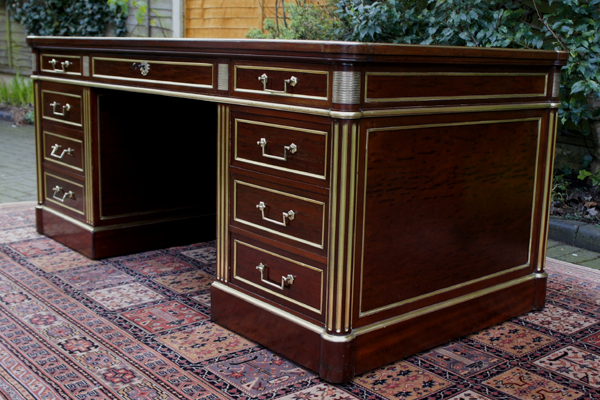 It is a very striking desk of top quality and its brass trim and brass handles make it a very decorative desk indeed. 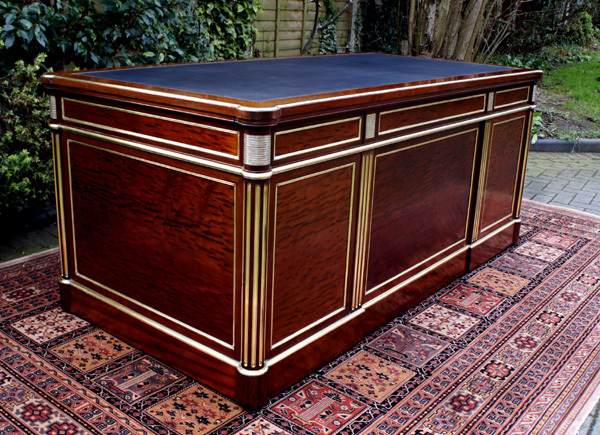 The top has a black hide writing surface with gilt tooling surrounded by a band of mahogany with a moulded brass border. To either side of the top are concealed slides used to extend the working surface by a further 16 inches (40cm) each side. The top is fitted with 3 drawers which are oak lined and have the original brass handles. The central drawer also has a brass lock with the original key. The desk has a central locking system which requires the central drawer to be unlocked and slightly open to allow all the other drawers to open. The top draw of the right-hand pedestal has a locking security box with a sliding top, presumably to keep valuables safe. The pedestals are each fitted with three drawers and have plinth bases and concealed castors. The outer corners of the pedestals have turned and fluted columns with inlaid with brass. and vanity board in a central section at the reverse, for ease of transportation and installation. Condition: The desk is in very good antique condition with the new writing surface. It has recently benefitted from cleaning and polish revival.